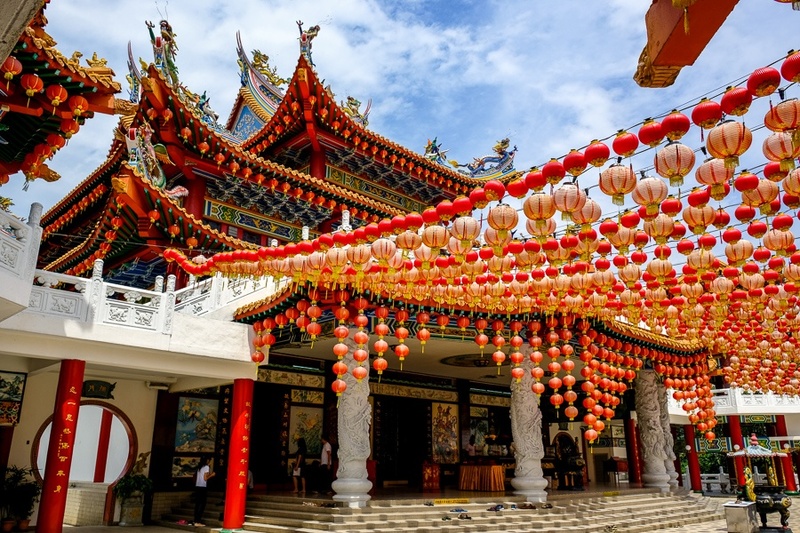 Thean Hou is a colorful Chinese temple in Kuala Lumpur, Malaysia, with some awesome architecture. It’s a contemporary building (1980s), but it has all of the classic features that make Chinese cultural objects so cool. The temple has 6 tiers, and it’s 100% free to walk around in any of them. From the top stories, you can also get some nice views of the surrounding highrises in Kuala Lumpur city. Thean Hou is a short distance from KL center, so it’s very easy to come here on a short detour if you’re already visiting the city. If you come to Thean Hou at night, the temple is lit up and it stays open pretty late. Better yet, if you come here on the Chinese New Year, the whole temple is decorated with glowing lanterns and puts on a great show. The temple is a 15 minute drive south from Kuala Lumpur City Center. The Grab transportation app works like Uber and it’s great for visiting places like this in Malaysia. Entrance to the temple is 100% free.